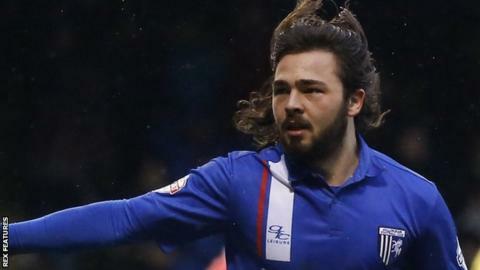 Gillingham moved up to second in the League One table with victory over Barnsley thanks to goals from Dominic Samuel and Bradley Dack. Samuel gave the hosts the lead when he latched onto Rory Donnelly's through-ball to finish past keeper Adam Davies. Conor Hourihane levelled for Barnsley on the volley but, a minute later, Davies parried Donnelly's shot into the path of Dack who tapped home. Hourihane could have levelled again but his late long-range shot went wide. Match ends, Gillingham 2, Barnsley 1. Second Half ends, Gillingham 2, Barnsley 1. Attempt missed. Josh Scowen (Barnsley) header from the centre of the box is close, but misses to the left. Corner, Barnsley. Conceded by Max Ehmer. Attempt blocked. Conor Hourihane (Barnsley) right footed shot from a difficult angle and long range on the right is blocked. Attempt missed. Aidan White (Barnsley) right footed shot from outside the box misses to the right. Corner, Barnsley. Conceded by Bradley Dack. Substitution, Gillingham. Jermaine McGlashan replaces Emmanuel Osadebe. Substitution, Barnsley. Otis Khan replaces Marley Watkins. Corner, Barnsley. Conceded by Adam Chicksen. Attempt missed. Ashley Fletcher (Barnsley) right footed shot from the right side of the box misses to the left. Delay in match Emmanuel Osadebe (Gillingham) because of an injury. Substitution, Gillingham. Adam Chicksen replaces Bradley Garmston because of an injury. Goal! Gillingham 2, Barnsley 1. Bradley Dack (Gillingham) right footed shot from the centre of the box to the centre of the goal. Attempt saved. Rory Donnelly (Gillingham) right footed shot from the centre of the box is saved in the top centre of the goal. Goal! Gillingham 1, Barnsley 1. Conor Hourihane (Barnsley) left footed shot from the left side of the box to the bottom right corner. Assisted by Aidan White. Attempt missed. Rory Donnelly (Gillingham) left footed shot from the centre of the box is high and wide to the left. Attempt missed. Dominic Samuel (Gillingham) left footed shot from the centre of the box is close, but misses to the right. Corner, Barnsley. Conceded by Bradley Garmston. Corner, Barnsley. Conceded by John Egan. Second Half begins Gillingham 1, Barnsley 0. First Half ends, Gillingham 1, Barnsley 0. Attempt missed. Adam Hammill (Barnsley) right footed shot from the left side of the box misses to the right. Josh Wright (Gillingham) wins a free kick in the attacking half.